The Imperium is in turmoil. Faith wars with rationality as the Ecclesiarchy and Administratum tussle for power. In disgust, the Ur-council of Nova Terra has led a fifth part of the Imperium into secession, striking out to forge a new destiny of their own. Seers speak hauntingly of the half-remembered terrors of Old Night, as warpstorm activity increases across the galaxy. Against a galaxy in flames, as mankind falls on itself, the Blood Angels stand as bulwark in the east. Even as the eyes of man turns inwards, the Angels strike out at the gathering horrors of the galaxy. A lot of the above likely sounds like gibberish! The naming scheme above is a development of one I made up for my May You Live Forever project, the details of which can be seen here. 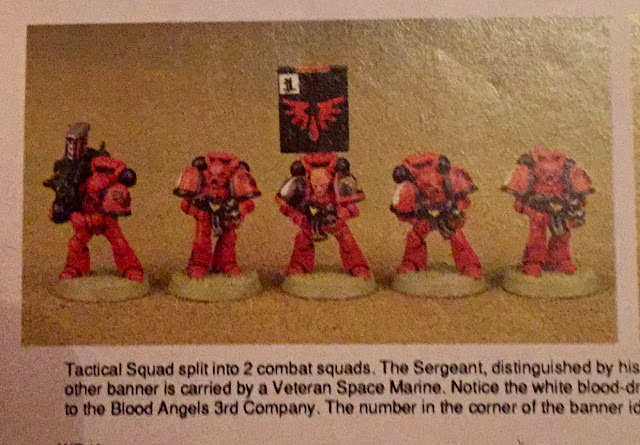 The army I'm building is a modern take on the Blood Angels Third Company army from WD139, one of the first issues I read, back when I was a nipper. 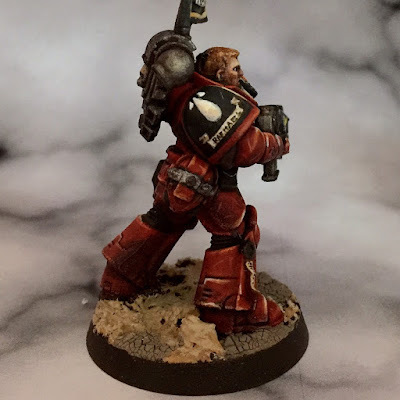 This is a bit of a love letter to 40k, then and now; and combining what I think is the best of both. Edited by Apologist, 18 August 2017 - 11:12 AM. Excellent stuff! As with all of your projects, I look forward to seeing this progress! Now that's a super cool idea with the old/modern look! While the old look will always hold a special place, the new version you've created look outstanding! can't wait to seem them fully painted! 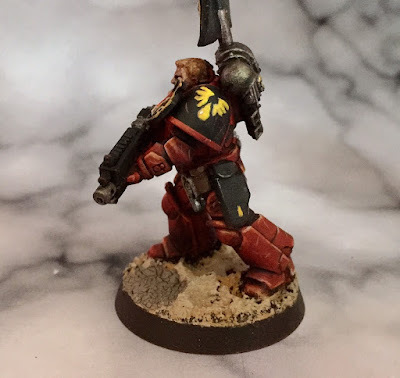 It's Apologist doing Blood Angels. What's not to like? So, uh, those look nice. Judging by your outstanding work with Cinnamon, this will be a fun ride. I am so hyped for this. Your progress so far is looking soooooo good. Well, that's an enthusiastic start! Thanks all. 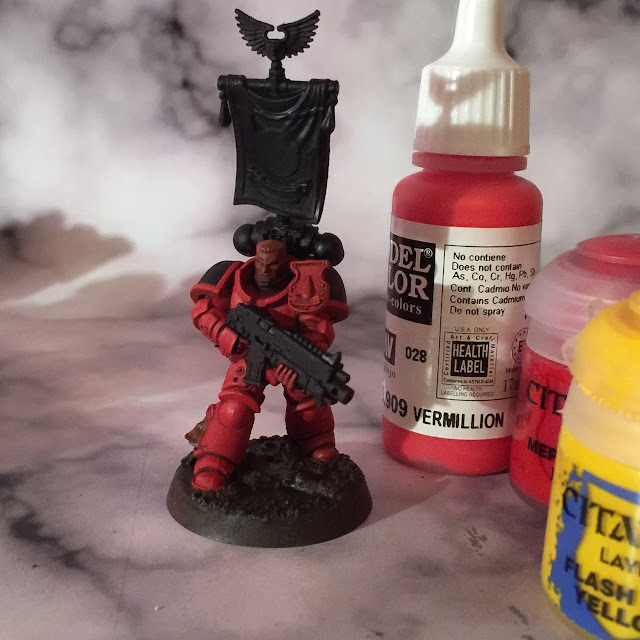 Not a tremendously exciting follow-up post from me, but I wanted to record how I'm painting them as I go along. 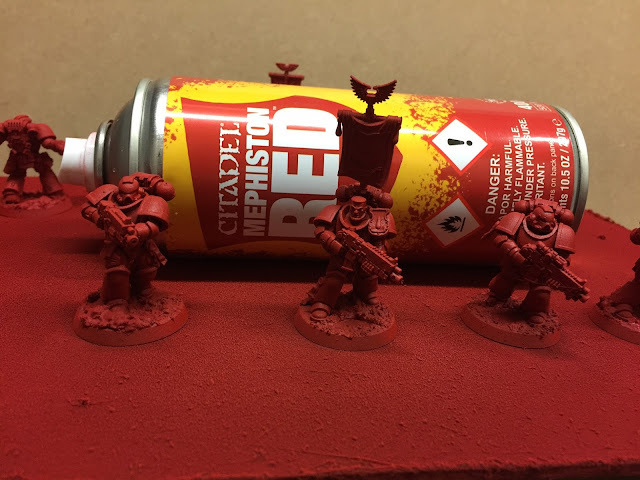 2: Spray using Mephiston Red spray. This is the first time I've tried out one of GW's spray colours. 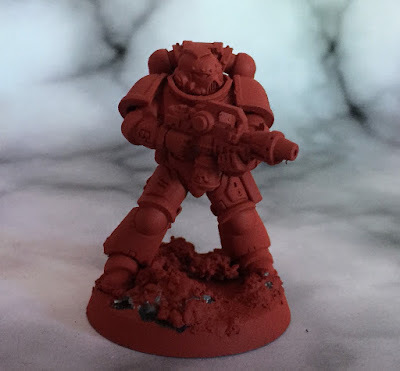 Usually I'd brush on the base coat, but this seems a good way to keep the result vibrant. 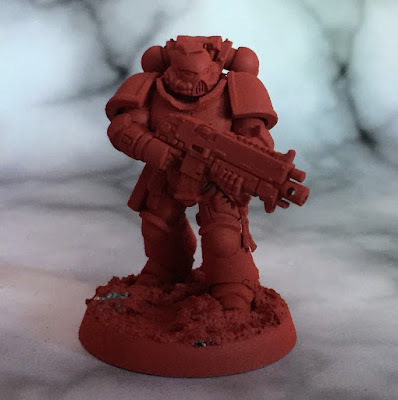 The models themselves are minor conversions of the new Primaris marines. 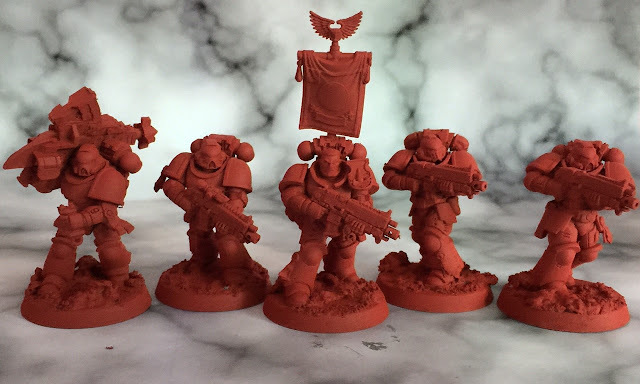 Aside from kitbashing the head and backpacks, the only real work for the majority is removing some of the sculpted detail (chest eagles, icons on boltguns etc.) and to reshape the ankle areas. I've varied the raised gorget; leaving some intact, reshaping others (as below), and removing it entirely for others. The retro-flamer was a toss-up between the one from the genestealer cultist sprue and the one on the Mark III sprue. I plumped for the latter, on the basis that it's easier to get duplicates for future squads. The missile launcher's a resin one, but the plastic one from the Mark IV sprue should work equally well. I found a little cutting and fiddling necessary with the hand and backpack to get the launcher to sit right, but otherwise it was a pretty painless process. In fact, I spent the most time on this conversion in making the 2nd ed. style trigger mechanism in the marine's left hand. This is a trimmed-down auspex, with the aerials cut down and repositioned to act as buttons. Cool, the missile launcher fits really nice. I have a few of those 30k launchers, might try it myself. I don't have the SM codex yet, is it an option? Like Thunder from the sky, sworn to fight and die. ~IN HOC SIGNO VINCES~ "In this sign you will conquer"
Know, foul xenos, Black Templars have come at last." I'm afraid I don't know how it'll work in game terms, but presumably they're still an option for Tactical/Devastator squads. Because the army's intended to follow the older models, I imagine there'll be a few oddments that'll need clarification before gaming with it. As noted on Death of a Rubricist, the original army list included a Lieutenant – at the time, it was a compulsory choice, I believe. 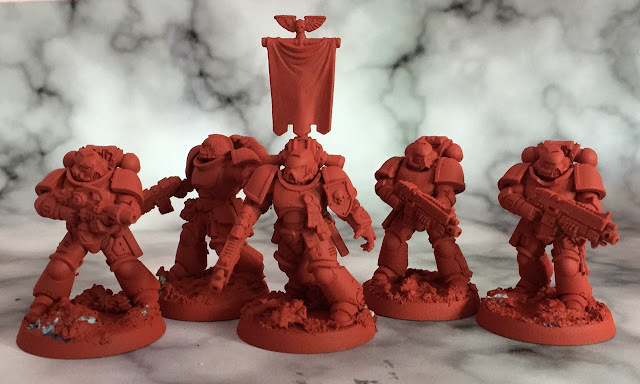 As far as I'm aware, however, I don't think the GW studio ever painted one for their army. He turns up in a later battle report as a gunner in a land speeder – a clever way to deal with the lack of a model! Taking inspiration from the Captain, I've included a halo (though not the death mask; that'll be reserved for 'Captain Tycho', or however I end up squaring that particular temporal circle). 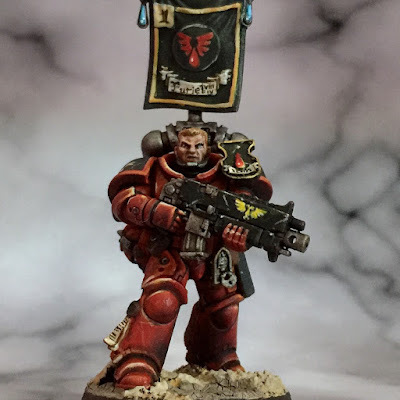 He has a banner – as these were very popular at the time – and a loincloth similar to the Blood Angels Captain model used for Tycho. Modern details include the wrist-mounted control pad thingie (which seemed suitable for a commander), while old background came back in the use of the skull-headed eagle pauldron and leg decoration. I didn't want him wielding two weapons, so he's carrying a scroll case (doubtless of some religious or spiritual quality), though I might try and replace that with some prayer beads. Painting begins; so here's a shot of Sergeant Raphael alongside two ne'er-do-wells to show the size of the chap. I'll take the model through to completion and then re-assess. I find looking at things midway through is a shortcut to dissatisfaction and spoiling a perfectly good model. I'm impressed with the model itself, though I was surprised with how flat the sculpt of the face was; very little interesting texture to work with. Awesome stuff! I demand shoulder mounted heavy bolters as well! Mate, that's an AMAZING red. Love the gradient from purple to yellow, I don't think it's in need of change at all. Gorgeous. I think the highlights are far too yellow in my eyes however.. The red is absolutely perfect though and the shading is fantastic. As expected, it looks great! The yellow does look a bit peculiar and it kinda distracts from an otherwise excellent model. Don't get me wrong, the highlights aren't bad and it's probably because I'm not used to see this style from you . The purple shading on the other hand is great. Have you thought about glazing over the highlights with orange or something else to dull them? But, yeah, maybe it's just the typical mid-painting-dread...gets me all the time. 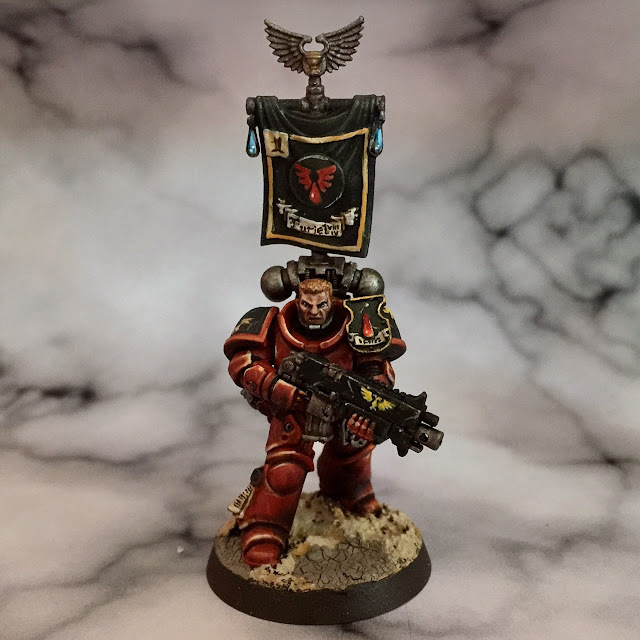 Btw, do you have any plans on expanding the marginal lore of the Interregnum for your Blood Angels? Edited by Isengrin, 07 August 2017 - 10:36 PM. Beautiful work. I've always found red to be a challenge to paint, and photograph. My Blood Angels take about 10 layers of red, shade, and highlights to get a strong color. I like the addition of purple in your scheme though. Holistically excellent as always, Apologist - your projects always follow a well-planned scaffold which guides their execution, and this is no different. It's the little details that really bring a force together and even this early stage of the plog demonstrates that: I especially like the mystic superfluity of the naming conventions, and their evocations of the Abrahamic angels. Not to mention the marble backdrop, which drives home the finery of the Host even more. I'm actually quite fond of the vibrant yellow highlights; they are a visual throwback to the style of 2nd ed Marines, so it suits what you're going for quite well. If you still wish to tone them down though, you might consider saving them for the most extreme of edges, so that the difference in colour (red and yellow are quite distinct as opposed to dark blue and, well, light blue) is reserved for where most light catches. Or perhaps a glaze of Carroburg Crimson to tie everything together! Then you will be pleased! The technique is consciously a bit different, as I wanted to try out a more classic, vibrant approach than the grungy approach I favour. However, even though I've gone for a cleaner look, I think my underlying painting style shows through anyway – seems you can't teach an antique autolocutor new syntax-cascades. Thanks all for the comments on the progress thus far. I'm going to refine it a bit further, probably by highlighting with a creamier white-yellow mix, rather than red-yellow. I now need to work out what I'm doing for the boltgun casings (yellow, like the first picture in the blog, or black as in the classics?) and the tilt shields. etc. Look closely. Through the storms. A mountain range. Closer. Closer. There. The Chapterhouse of Bibelo is one amongst dozens in the Otranto wing. Like much else of the fortress-monastery, most are closed, their statuary draped with cloth, their doors bolted and windows shuttered. Periodically, nomadically, the Chapter moves from one Chapterhouse to another, like aristocrats in a too-large manse. The last in the cycle is closed, reverently, its treasures covered and boxed; even as the next is opened. The serfs, servitors and aspirants go in advance, bearing incense-suffused candela-torches; brooms, brushes, and rad-gear. Dust is chased from the Chapterhouse, cloth is beaten jealously, tarnished metal made to shine once more. All is restored as best the staff are able. Masterworks – paintings, sculptures, tapestries – are cycled from shadow to shadow to preserve them. Those locked in place – the frescos, the carvings – must bear the pernicious sun with naught but dustcloth to preserve them. It is a battle against entropy itself. A serf carefully lifts aside a cloth of fine cottovellum, and grimaces. The painting – an angular rendering of the fourth Prince of the Existon – made a mere decade ago, reveals varnish that is already yellowing in Baal's hard atmosphere. It is a scene repeated across the Chapterhouse, hundreds of swathed men, women and children hesitantly revealing what has failed since last the Chapter stood here. A handful of the oldest works in the Chapterhouse were made mere centuries after the Division. These are little more than mustard-brown smears, the images beneath all but lost. The wood carvings are bleached. Stone has endured better, but forty-five centuries of accidents – even if only once in a generation – means that rare here is the statue that stands unblemished by time. Still, the Chapterhouse of Bibelo is one amongst dozens in the complex. Tucked in a nook of the monastery, nestling between the mountainside and the Chamber Cordaline, it has survived better than most. Some, shamefully, have fallen into mandated disuse; rad-rot having penetrated too deeply, the roofing collapsing, walls slumping, or general disrepair overcoming the staff's ability to make good the damage. A series of Masters – Malapapa, the two Leos, Amareo – made reforms to the monastery; even extended it. The Strateia were scattered about the whole extent; though even with an entourage of servants, the Astartes of the Chapter could not fill the suites and chambers. In the time of Locasto, it was common for the whole brotherhood to be stationed here, but even then, how could a thousand hope to fill a space made for legion? It was, and remains, an echoing place. Today, as the Imperium bears another period of extended conflict, the Fortress Monastery of the Blood Angels is owl-haunted, its garrison positively skeletal. Today, the Chapter assembles in the Chapterhouse of Bibelo – at least, those brethren present. 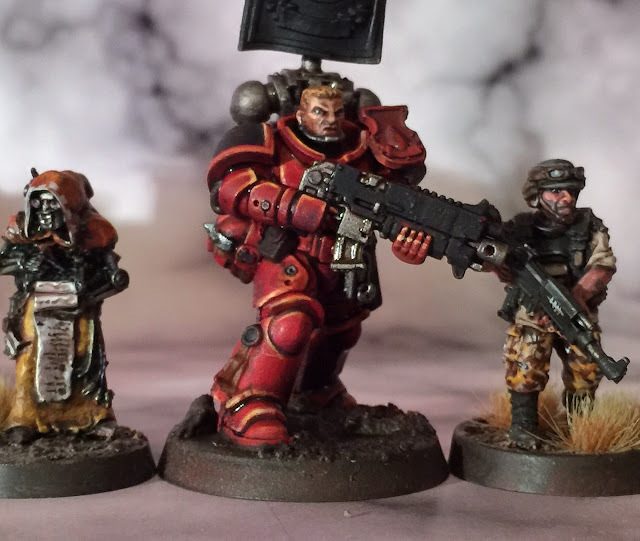 Two members of the Chaplaincy stand in the centre of the alongside Martan, the Sanguinarian, and Master Formosus, heir of Sanguinius. The current Kolonio garrison company – the honoured Erelim, the third Strateia – enters, heads up, white honour-stoles across broad shoulders. Ancient Nonesuch heads the parade, the Prince Dahavauron (or Erasmus Tycho, to give him his atroatican name) a humble step behind. Montefeltro, Tycho's lieutenant, follows in turn; and behind him the Wards of Erelim. 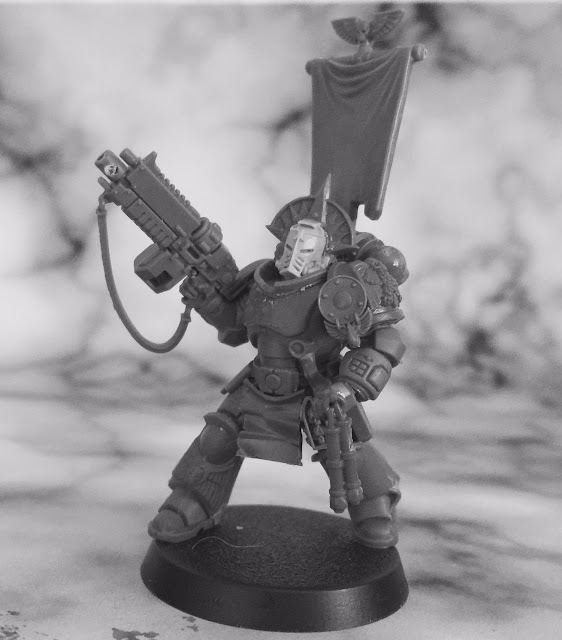 A handful of ascendant scouts are next, bearing banners, honours, and golden images of the Emperor on long nalwood staves. Trailing these are scores of retainers, plenitentaries and honoured indents, led by the Maestri Internuncia. Finally, the scarlet-armoured veterans of another war march in, to take up their role as Kolonio in turn. These are the fifth Strateia, the Oertha, commanded by Prince Ofaniel Glorioso. Only they are not. Not any more. Ofaniel is borne in an adamantium casket by four of his charges. One limps, favouring his right leg. One is missing an arm. The eye takes in barely eighty brethren; and some of them are marked with the heraldry of the reserves. It has clearly been a hard war. Warriors take their places in the gleaming Chapterhouse, standing or seating themselves rigidly on the pews as per their duty. Serfs scuttle about, namato-putti flit to the rafters. Marching falls to shuffling, then to silence. 'Who commands?' The rich voice calls out, across a room barely a quarter filled, but once more resplendant and vital. The Chaplain-Sabatine, Puglius, is an imposing figure, but as Master Formosus – scarred and pitted – steps forward, even he is thrown into shade. 'I speak for Ofaniel. I speak for the dead.' 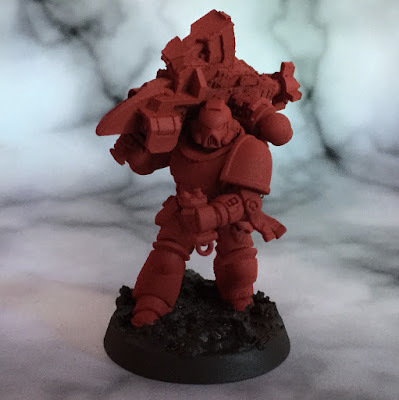 The Chaplain-Sabatine bows and steps back, leaving the Chapter Master to ascend to the heart of the Chamber. Time passes, as the honorifics are played out according to ritual. Montefeltro has heard the change of Kolonio many times, but it is an anchor to him, as Baal is an anchor to the soul of the Chapter. This is an age of change and challenge, and the rituals are reassuring to him. Montefeltro has lived the lifetime of four men, and yet does not remember a time before the Twin Imperium. He knows, half-unconsciously, that it began in the time of Amareo, or Master Falstaff, or Conccio; and the Blood Angels aligned themselves with Terra; or Nova Terra; or were studiedly neutral. What does it matter to him? In these enlightened times, the chronicling of antiquities is dead. There is little enough time for the present. Why look backwards into the past? What of relevance can it teach him? What could it hold up to the verities of the Ecclesiarchy? ...And yet Master Formosus is pushing the Chapter towards renaissance. Not for him the comforting certainties of ritual, of divinity, of acceptance. To become a Chapter Master is to become an Imperial Commander. To be an Imperial Commander is to grasp that rarest of duties, that rarest of rights; that right and duty to question. Edited by Apologist, 16 August 2017 - 12:42 PM. The following recipe's as much an aide memoir to myself as advice – I'm certainly no authority on painting red. Note the first steps are duplicated in an earlier post; I wanted to keep everything together. _1 Prime using Halford's red primer. Good coverage with this warm primer will help to disguise any later mishaps – having small gaps here and there will reveal red areas, which will take fewer layers to cover – important for a clean finish. _2 I toyed with the idea of a zenithal spray (i.e. spraying just from certain angles), but in the end decided to go for as even a finish as I could get. 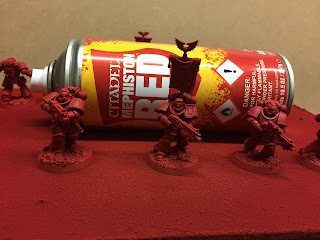 I used GW's Mephiston Red spray; a first for me. 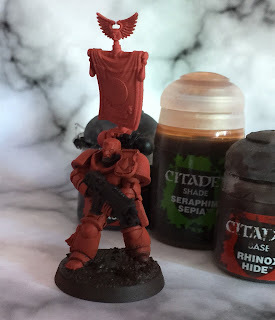 Because mistakes are so obvious in red, I wanted to get as even and consistent a red as possible, and one as close to the paint colour I would be using. 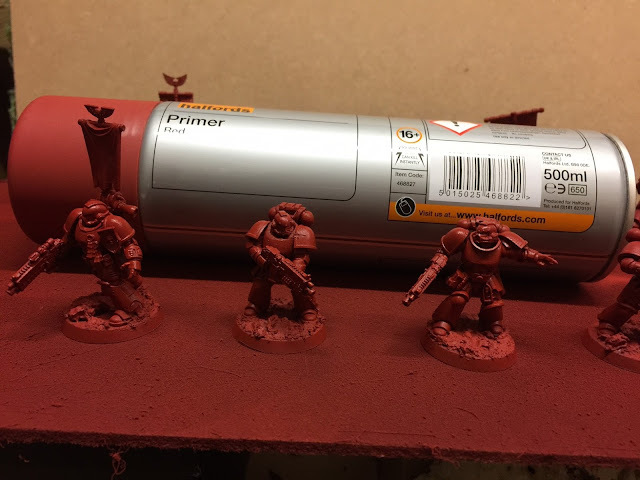 The difference between the priming and basecoat here is not immediately obvious in the pictures, but is clearer to see in person. _3 Once dry, paint the base using Rhinox Hide. I do this early on for two reasons. Firstly, to provide some contrast, and secondly, if I accidentally get some paint on the feet, it's easier to clean up as we come to paint the armour. Once the base is dry, wash the recesses of the armour (note, not the whole model, just the recesses) with Gryphonne/Seraphim Sepia, allow to dry, then pick out the metal/black areas with Chaos/Abaddon black. 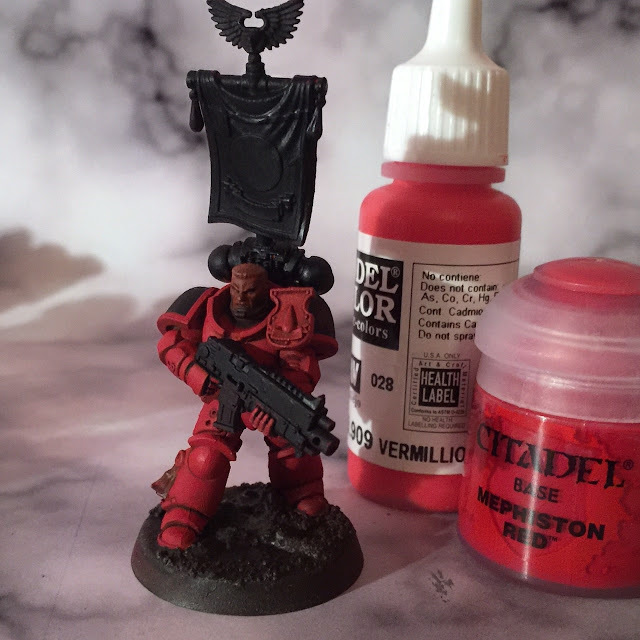 _4 Mix Mephiston Red and Vermillion (Vallejo model colours) and repaint the red areas. In addition to strengthening the colours, it adds a layer over the base coat and alters the texture, making sure everything's consistent. This mix is slightly orange – in the past, my reds have always been quite cold and blue-tinted, so I wanted to try a yellow-tinted red here. _5 Initial highlights start to go on now, with the addition of Flash Gitz Yellow to the mix (a mistake; I should have used a warmer yellow like Golden Yellow). These are built up slowly, paying attention to the direction of the light. The image here shows the early stages; and they're not particularly visible. The marine's right gauntlet shows it most clearly, but you'll get a better idea if you skip ahead ot the next stage, where the highlights are more obvious. _6 With the highlights in place, I decided to use a glaze to blend things together. 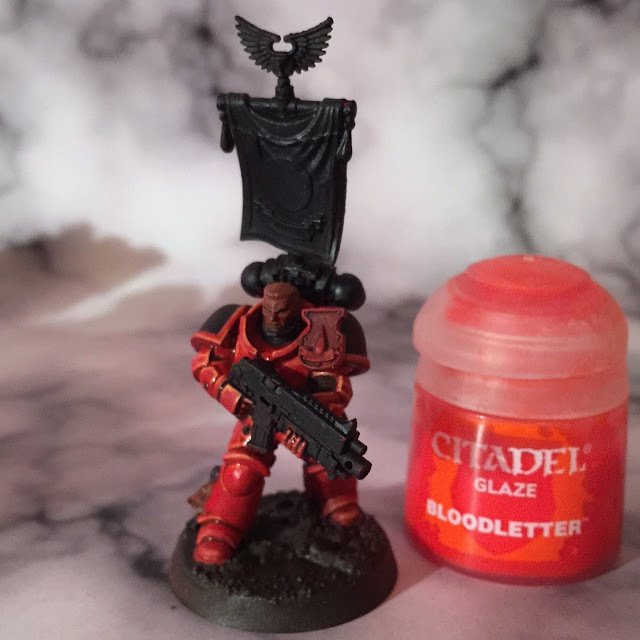 I'd usually use an ink (Winsor & Newton inks are good), but in the spirit of experiementation – and a desire to avoid a glossy finish in the recesses – I used GW's Bloodletter Glaze. A glaze will soften transitions, but the depth it gives to the red makes it well worth it. _7 With the glaze completely dry, it's time to turn up the contrast. Because we want to keep the impression red, we can't over-emphasise the highlights, or it'll risk turning the impression orange. Instead, we concentrate on the shadows. Building the tone up here increases the contrast and further emphasises the red. I used a watery mix of Liche Purple, sepia ink and flow enhancer to get a rich tone, then built up the shading with both washes; in deep recesses and areas of strong texture like the soft undersuit, and glazes; in large rounded areas, like the insides of the legs and on the knees. This essentially completes the basic red armour. If necessary, you can reinstate highlights or further develop the shadows until you achieve the correct tonal balance. Remember, what's 'correct' is what looks right to you. If you're unsure, put the figure down, walk away for a few minutes and come back to it later, with fresh eyes. Edited by Apologist, 10 August 2017 - 09:08 AM. 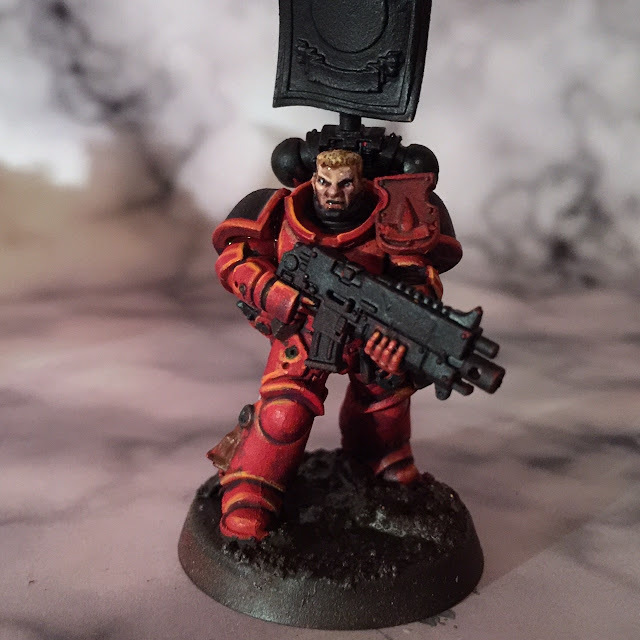 I hope he's recognisable as an update of the Sergeant from the first squad of the original army. There are obvious differences in detail – the tilt plate is an obvious one – and working out how to paint the intricate details of the modern plastic against the softer, cleaner lead model was quite fun. I toyed with yellow bolter casings, but decided in the end to stay as close as possible to the original inspiration with this squad. One little detail I really like on the new Primaris models is the little box for automatically blessing bolt shells – that, in a nutshell, is 40k for me. The black areas, as usual, were not quite black – I've mixed in a hint of Flash Gitz Yellow and Charadon Granite to stop it being completely dead, and to give me some 'tonal room' to shade with. One change I did make was to the backpacks, rendering them completely in metal – a nod to older models. Rather than deadening black, I washed them with Leviathan Purple and Seraphim Sepia. These mixed on the surface to form interesting neutrals. 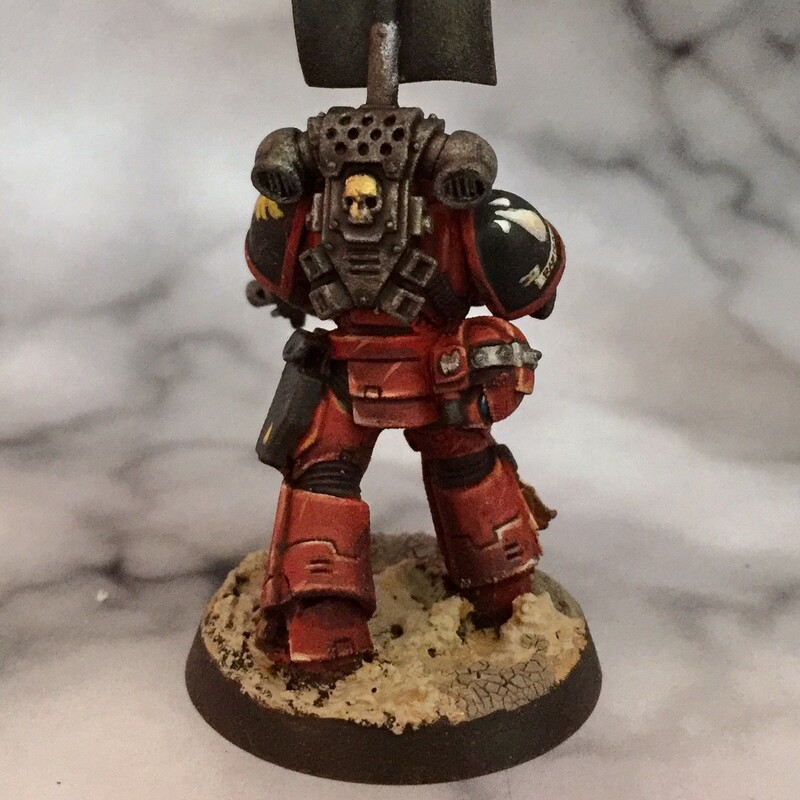 Because I also used these washes on the red armour, it helps to tie the piece together. The right pad is an example of where I've gone off-piste a bit. The original simply has a white blood drop to indicate the third company. I decided that I'd add a supplementary small blood drop on either side of it, and a nameplate below, just to make this more personal to me. So, there's Furiel 8:04. Hope you've enjoyed the ramblings – or at least the pictures! Fantastic work! 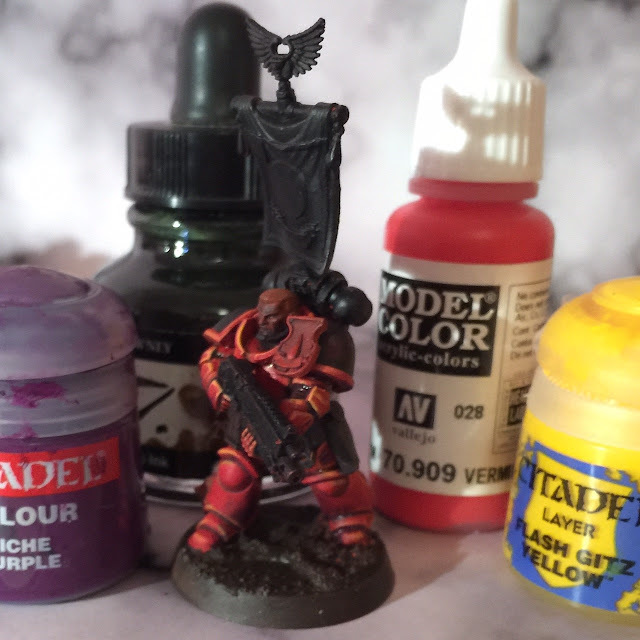 I am really envious how you manage to achieve such a warm and vibrant feel to your miniatures, it really gives each one a sense of character! The background as usual is great, and really sets the scene for the armies theme. I look forward to seeing what you have planned next. Now you've found the perfect balance between paying homage to 2nd Edition and keeping your distinct style visible. A splendid paint job. Nice work with the story, too! Edited by Isengrin, 10 August 2017 - 02:58 PM.